Many of you stopped by our booth, and entered into our jacket and legging giveaway. And the luck winner is ….. Abby P. from Rhythm & Blades! Congratulations Abby!! Abby won the Embers Pullover from our new Lifestyle line, which was a favorite amongst visitors. Thanks to everyone that stopped by our office and our booth – you helped make it a special and successful week for us, and we value your input and feedback! It’s hard to resist the appeal of bright, bold colors, which really “pop” on the white background of the ice. Bright blues in particular really looked spectacular. Theme costumes, especially for the Juvenile and Intermediate teams, were made even more phenomenal this year with the use of Dye Sublimation, which allows you the ability to print any design you want onto fabric. The Lion King, Wizard of Oz, and Aladdin themed dresses below all used dye sublimation to create one of kind fabric prints! We enjoyed seeing bright underskirts peek out through slits during turns, spins, or leg lifts. 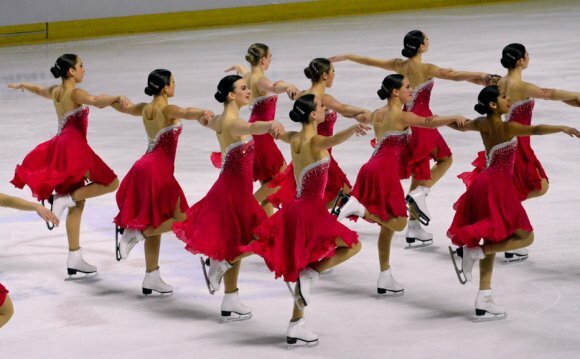 Skirts that emphasize movement and speed are usually one of the most important aspects of successful synchro dresses.